Because of the Texas Supreme Court’s recent opinion in Texas Rice Land Partners v. Denbury Pipeline, Texas landowners across the state are questioning the right of pipeline companies to exercise the right of eminent domain to condemn easements over their land, including the right of Keystone Pipeline to condemn easements for its pipeline from Canada and through East Texas to the Texas Gulf Coast. In the Denbury case, the Supreme Court held that a pipeline does not acquire condemnation authority merely by obtaining a permit from the Railroad Commission and subjecting itself to that agency’s jurisdiction as a common carrier. The Commission makes no determination whether the intended use of the pipeline is in fact “public.” The court then held that in order for a pipeline to serve a public purpose and thus have condemnation power, “a reasonable probability must exist, at or before the time common-carrier status is challenged, that the pipeline will serve the public by transporting gas for customers who will either retain ownership of their gas or sell it to parties other than the carrier.” Once a landowner challenges its status as a common carrier, “the burden falls upon the pipeline company to establish its common-carrier bona fides if it wishes to exercise the power of eminent domain.” The court also held that one affiliated company transporting gas solely for the benefit of another affiliate is not a public use of the pipeline. The court said that the question of whether the pipeline is dedicated to a “public use” is ultimately a judicial question. Denbury is also being cited in an attempt to halt condemnation proceedings for the Keystone XL pipeline in East Texas. 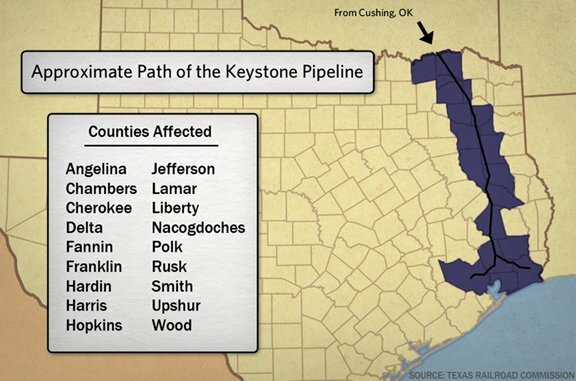 Notwithstanding President Obama’s refusal to approve the project, Keystone is apparently continuing with its acquisition of right-of-way in East Texas. “We don’t need a presidential permit in order for us to obtain the easements that we need for the right of way for this project,” said TransCanada spokesman Terry Cunha.